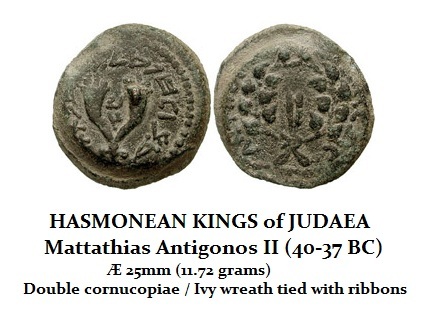 Antigonus II Mattathias (died 37 BC) was the last Hasmonean king of Judea. He was the second son of King Aristobulus II of Judea. Together with his father, he was carried off as a prisoner to Rome by Pompey the Great in 63 BC. Eventually, he escaped and returned to Judea in 57 BC. Despite an unsuccessful attempt to oppose the Roman forces, the Senate released him, but he refused to surrender his dynastic rights. After the death of his older brother Alexander, Antigonus claimed that his uncle Hyrcanus was a puppet in the hands of the Idumean Antipater and thus used this to justify trying to overthrow him with the help of the Romans. Antigonus did visit the rival of Pompey Julius Cæsar, who at the time during 47BC was in Syria. There Antigonus complained of the usurpation of Antipater and Hyrcanus. About 5 years later, in 42, Antigonus attempted to seize the government of Judea by force with the assistance of his brother-in-law, Ptolemy Mennei. This attempted conquest was met with defeat by Herod the Great. 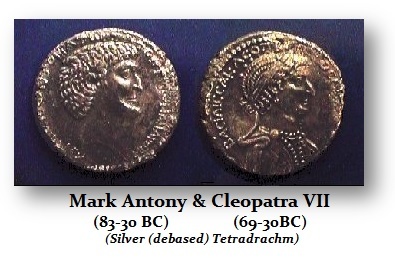 It was the break between Octavian and Marc Antony that resulted in a sharp increase in taxation by Antony and Cleopatra. This is what eventually would be long remembered and turned toward a deep resentment against Rome. The Parthians, who invaded Syria in 40BC, were the rival to Rome and they supported Antigonus who promised them 1000 silver talents and 500 women slave girls. The Parthians sent five hundred warriors to assist Antigonus. Hyrcanus was captured, his ears were mutilated, and then he was sent to Babylon. Herod managed to flee from Jerusalem and thus Antigonus was officially proclaimed king and high priest of Jerusalem. Just after the conquest of Jerusalem by the Parthians, Herod I was forced to flee Jerusalem with his family and sought refuge in the desert fortress of Masada. Herod I proceeded to Egypt to seek the help of Cleopatra VII in Alexandria. She received him most graciously, declined to aid him against Mattathias Antigonus. Herod then continued his journey to Rome to seek help. He requested the help of Rome to guarantee him the crown of Judea. Marc Antony and the Roman Senate named Herod King of Judea and Samaria. After a week, Herod returned to Palestine. There the struggle for sole reign began with Mattathias Antigonus resulting in a war that lasted another two and a half years. Many believe that in the Dead Sea Scrolls, otherwise known as the Qumran Scrolls, it was Antigonus who is the figure known as the Wicked Priest. The Jewish population in Jerusalem feared the demise of the Hasmonean Dynasty from what they saw was a usurper of the Herodian Dynasty. Therefore, the coinage during the siege of Jerusalem depicted the most important religious objects – the menorah and the showbread table on the other. Therefore, these coins were clearly politically motivated to rally support for the last of the Hasmonean kings Antigonus II Mattathias.